In 2009 and 2014, a simple chart pattern enabled us to turn bullish the dollar, just in time for HUGE rallies. Learn to use this pattern now. "I know we're heading northeast at 430 mph. But... I have no idea when or where I'm supposed to land." That's when you cough up your bag of peanuts! Dramatic? Sure. Imaginary? Yes. But it also highlights the real limits of mainstream financial analysis, which has no trouble identifying the current trend in a financial market -- but has little idea as to when or where that trend will end. 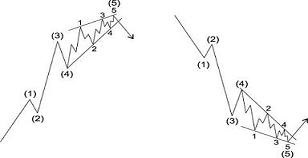 One Elliott wave pattern above all else signals the trend will soon end: the aptly named, Ending Diagonal. It only forms in the final position of a wave sequence -- i.e., wave 5 of a 5-wave impulse, or wave C of a correction, just as the trend is about to turn. 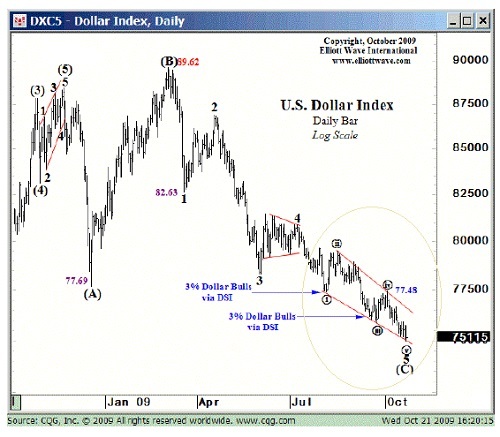 To fully appreciate the wonder of ending diagonals you have to see them in a real-world market -- like the U.S. dollar, where this pattern precipitated not one, but two of the most dramatic turning points in the buck's recent history. Of course, you know that the Fed has kept interest rates at the same low levels, near zero, since 2009, for 6 long years -- yet EURUSD did the opposite of what the mainstream pundits expected. "The [U.S. Dollar Index] still has not 'spiked beneath 74.92, the lower trendline of the fifth-wave ending diagonal that we've been discussing. Absent this price behavior, a rally above 77.48 would be another signal that a significant low is in place. Until then, we patiently wait for the current wave structure to complete." 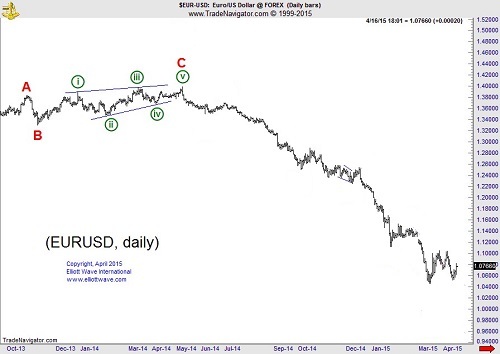 "The dollar sentiment remains bleak as night... and the wave count once again appears terminal. The coming advance in the dollar should be exceptionally powerful." Result: As the ending diagonal pattern suggested, soon after the U.S. dollar index took off in a powerful rally to a one-year high against the euro. Now, flash ahead to May 2014: Once again, U.S. dollar "doom talk" is back. Against the euro, the dollar stands at a 2.5 year low, near $1.40. "The wave labels on the chart denote the pertinent legs of the rally...Wave C of (4) traced out an ending diagonal to complete the advance. Last month, prices broke below the diagonals lower boundary, confirming the end of the large degree rally. 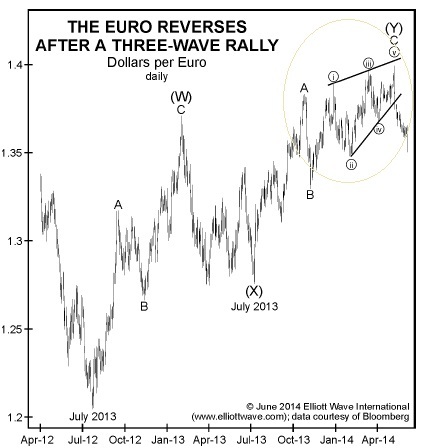 The decline should be the first of many down waves that carry the euro lower over the remainder of 2014." Result: From that May 2014, the U.S. dollar soared (and the euro slid) in the fastest rise in 40 years, ascending to a 12-year high against its European foil by March 2015. This is why ending diagonals are one of the most high-confidence Elliott wave patterns. But it's just one of many. Imagine how much knowing other patterns could help you with your markets. Register now, 100% free, and get instant access to 3 insight-packed introductory trading lessons. Then each day through April 28 we will email you more free trading lessons that you can apply to your trading immediately. 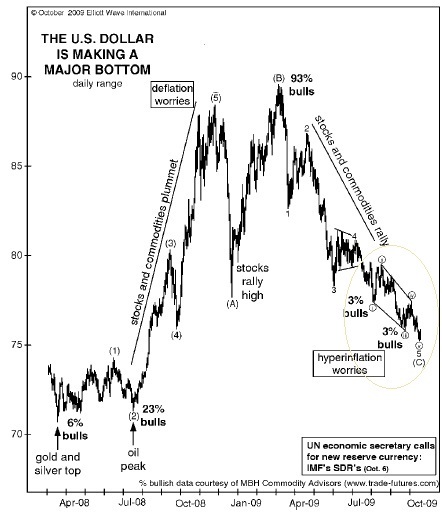 This article was syndicated by Elliott Wave International and was originally published under the headline Why 2 of U.S. Dollar's Recent Bottoms Have 1 Thing In Common. EWI is the world's largest market forecasting firm. Its staff of full-time analysts led by Chartered Market Technician Robert Prechter provides 24-hour-a-day market analysis to institutional and private investors around the world.